Do You Know About the Popular Apps Spying on You? If you think that your smartphones and iDevices are secured, then you are absolutely being negligent about it. It has been reported that there are many apps downloaded on your mobile, which can record your calls, access private data, view your pictures or videos, track your location and do much more without your information. It is indeed a dirty secret affecting people in some or the other way. These apps are pre installed or done by user for some purpose. 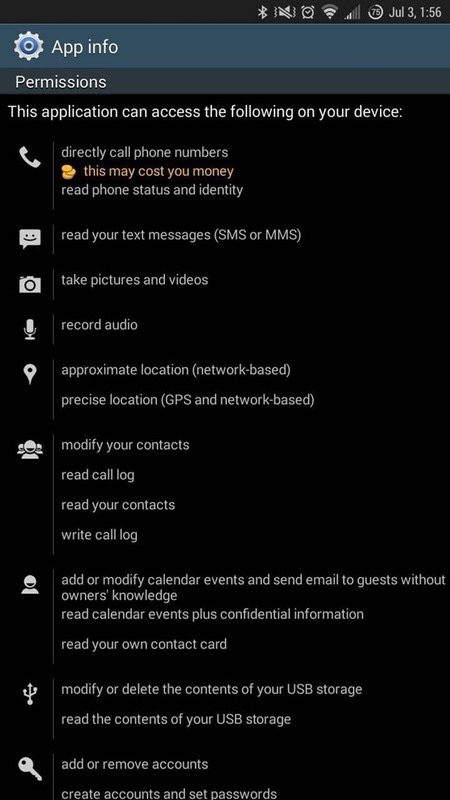 Some of the apps mention about this information (taking your personal data) on their Terms and Conditions page. Hitting ‘Agree’ button to their terms can probably lead you towards installing spyware on your mobile device. In this way, these apps are indirectly doing much more than we can think of. Cyber security experts take these spyware additives as a threat to your privacy and security. Installation of spying software, such as mSpy on your child’s mobile, is a kind of precaution you take for your children to prohibit going to wrong hands. However, if your kids install any game or app on their mobile and it hacks their pictures, call recordings, geo location or anything else; then it is a kind of unsafe thing for their personal data. Taking an example of flashlight apps, there are about millions of users downloading these apps every day. The users download these flash lighting software apps, but they don’t actually realize that they are being brought into darkness and even when the app is turned off; it accesses your mobile data. There are terms of multiple pages, which are not read by users and hence, by agreeing to these conditions, users give permission for accessing their mobiles. This is where the actual chance of misuse begins. It is a frightening thought that people around the globe are getting your personal info, hearing to your conversations, looking at your pictures and even tracking your geo location. 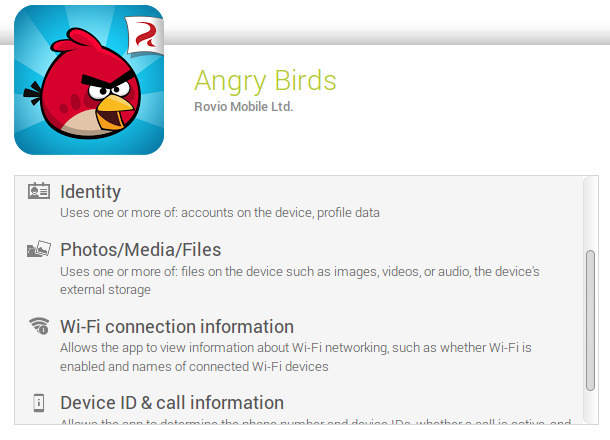 Angry Birds Free – as every free app, popular Rovio game requires some personal data in return for free download option. 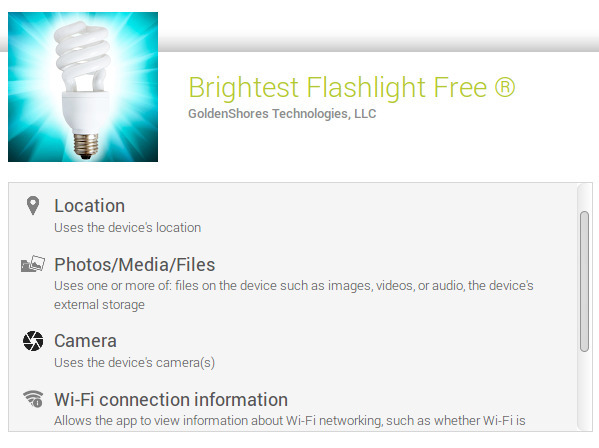 Free Flashlight apps – after big privacy buzz about Flashlight apps, some of them have removed suspicious permissions, but several still want to collect more than they supposed to. Watch carefully what are you agreeing to. Examples: Brightest Flashlight Free, High Powered Flashlight, Brightest LED Flashlight, etc. Potentially, every game you can download for free. Sadly, very often it is your kids who fell for this trick, since they rarely read anything before launching favorite app. 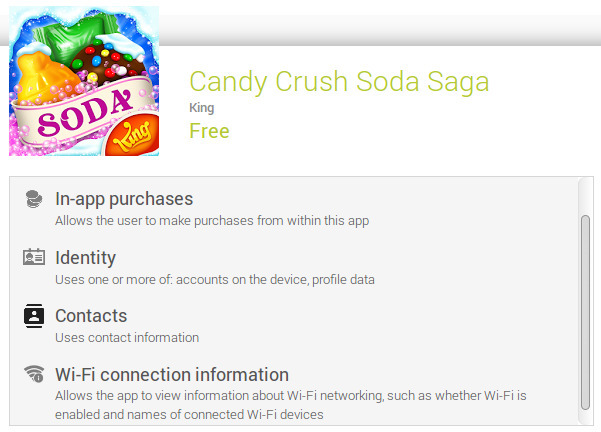 For example, Candy Crush Soda Saga, one of the top entertainment apps today, is no difference: With more than 50 millions downloads, how many people have read its License Agreement? Insanely popular app, which asked for a permission for full access to users Google account – mail, contacts, connected apps and other information. After some time this was announced to be a bug, but in cases like that it’s pretty hard to call it a coincidence. At the current moment app needs access to GPS location, media files, camera and still connects to Google account, but with less requirements. Considering how it works, these features are necessary for it, so in the end, it’s up to user whether to start playing on these conditions or not. Moreover, due to the raising number of incidents with children, who sometimes hardly can pay attention to the surroundings while they are playing, some parents decide to block Pokemon Go game in purpose, or at least, control how their kids spend time playing. How to protect yourself from the trap of spyware? Delete the apps which you don’t use on your mobile. Be careful while you download any application. Check their email ID and website details. Read privacy policies carefully and mainly for the cases of free versions of any games. Make sure that you can turn on anti-spyware software on your mobile. How Can Parents Monitor Snapchat Messages? How Can Someone Hack My Text Messages Online? Home » How to Use Sms Tracker » Do You Know About the Popular Apps Spying on You?